What are Accident Event Recorders (AERs)? Accident Event Recorders refer to the use of video technology to capture events, both in front of the vehicle and/or inside the cab. An example, earlier this year, is the fatal accident caught by a transit bus involving the then Bruce Jenner. According to Safety, Claims and Litigation Services, LLC, (SCLS) an affiliate of National Interstate Insurance Company, AERs can improve driver performance and save lives. AER technology is not a “black box” accident recorder, known as an Electronic Control Module (ECM), and it is not an electronic logging device (ELD). AERs capture real-time video and sometimes other data in the course of an event, incident, or accident. Fact: almost everyone over-estimates their personal performance, especially in driving. AERs can be used as a coaching and training tool by capturing events that may be indicators of a bad driving habit, a risky behavior or even plain ignorance (you don’t know what you don’t know). Secondly, we know that most drivers behave differently when they know they are being monitored. AERs, however, begin recording an event when triggered by a sudden movement or hard braking (G-forces). Studies of driver behavior when AERs are introduced seem to show an improvement in driver behavior, shown by a reduction in claims. And fewer claims means lower insurance rates, let alone the cumulative savings from collision avoidance. After reviewing the driving behavior and incidents of 39 companies over a 6-month period using AER technology, companies were able to save upwards of 24% on their losses per AER installed. So, for a company with a fleet of 50 vehicles, that’s a claims cost savings of nearly $32,000 per year. SCLS found that those same 39 companies in their study were able to reduce the number of incidents by nearly 10% in just a 6-month period. Accident Event Recorders should not only pay for themselves, but result in a return-on- investment. The greatest return might be in knowing your fleet is operating safely. 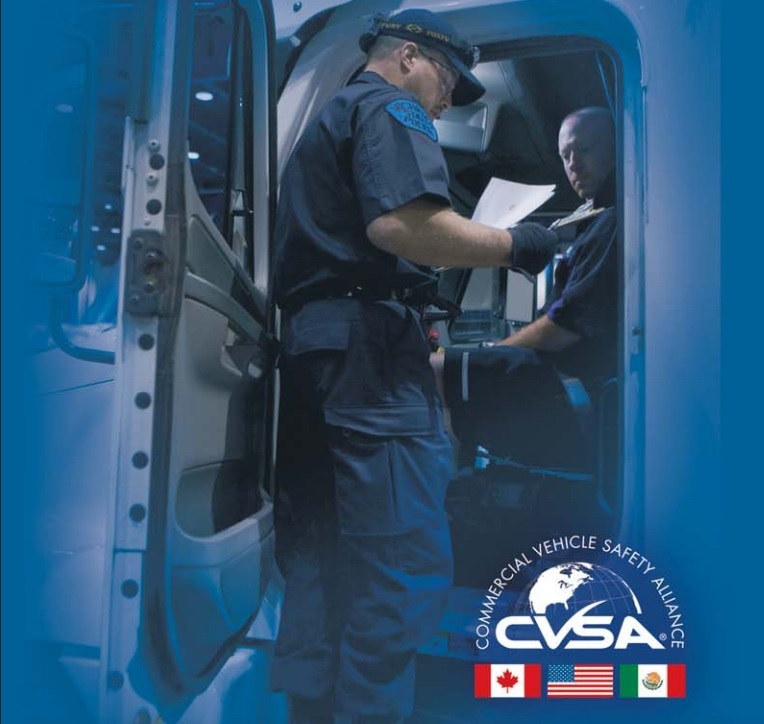 According to the CVSA, about four-million commercial motor vehicle inspections are conducted every year throughout North America. Inspections are conducted on various levels, ranging from Level I North American Standard (NAS) Inspection to Level VII Jurisdictional Mandated Inspection. What should a driver expect during a roadside inspection? How can a driver prepare? The first thing the Inspector will make note of is whether or not the driver is wearing a safety belt and if the driver is wearing required eye glasses or hearing aids. Some drivers say they have to unbuckle their safety belt to get to their wallet. If so, always wait until the Inspector is present before unbuckling . . . And stay in the truck. Where did you load? When? Where did you last pick-up fuel? Do you have that fuel receipt? Do you have any other receipts for this trip? Where is your load headed? The inspector will generally collect any driver trip paperwork as soon as possible. All the time, the inspector is looking for information to pinpoint the driver to certain places and times during the course of the trip or the previous seven days. The goal is to build a timeline to see if driver is keeping accurate records in the log book. The inspector will frame questions to require a narrative answer from the driver and will keep the driver engaged in conversation to gain additional information. The inspector will verify time and locations with trip receipts, other trip documents and information from driver. A trip in the mountains or in bad weather averaging 500 or more miles per day. A driver taking a whole day off— four days into a trip— if the driver is paid mileage. Inconsistencies in what the driver says, body language or trip documents. What’s the secret to passing a Roadside Inspection? Besides doing a good pre-trip inspection and keeping good trip records, a driver should be organized and always log accurately. Can You Fuel and Pretrip — At The Same Time? Can a driver fuel and pre-trip at the same time? Activities of truck drivers are regulated by DOT rules. When not driving, a driver is covered by OSHA rules. OSHA rules require a safe working environment and incorporate NFPA Flammable and Combustible Liquids Code. Some municipalities have also enacted various rules against leaving your vehicle unattended while pumping fuel. Simple answer — a driver may not — because even if not illegal, per se, to do so, he would not be in a position to attend to the fueling, if checking things out at the same time. (1.) Most fuel pumps have signs posted — instructing fuel pump operators not to overfill gas tanks or leave them unattended while fueling. (2.) Some local fire chiefs have issued fines for leaving a fuel hose unattended while fueling. (3.) Even if there are no local rules prohibiting the practice, a company could be cited by OSHA for a “de minimis violation.” De minimis violations are violations of existing OSHA standards that have no direct or immediate relationship to safety or health. This is a kind of a warning. A reasonable person should conclude by the above that a driver could: pre-trip and then fuel the truck. Company policy may differ from the above, so always follow company policy or the law, whichever is the higher standard. Must all flatbed trucks or trailers have a header board? I just got a phone call from one of our drivers, who said that by January 31st all flatbed trucks or trailers must have a headboard. Has anyone else heard of this? “Header board is adequate, secure,” says the California CDL Manual. This does not say much. Inspection of the header board should include checks for missing rivets, damage (forklift damage, corrosion — beyond surface rust or corrosion — broken welds, or cracks). The structure should be upright — not leaning or bent on an angle, forwards or backwards. (a) Applicability. The rules in this section are applicable to commercial motor vehicles transporting articles of cargo that are in contact with the front end structure of the vehicle. The front end structure on these cargo-carrying vehicles must meet the performance requirements of this section. (b) Height and width. (1) The front end structure must extend either to a height of 4 feet above the floor of the vehicle or to a height at which it blocks forward movement of any item or article of cargo being carried on the vehicle, whichever is lower. (2) The front end structure must have a width which is at least equal to the width of the vehicle or which blocks forward movement of any article of cargo being transported on the vehicle, whichever is narrower. (c) Strength. The front end structure must be capable of withstanding the following horizontal forward static load:(1) For a front end structure less than 6 feet in height, a horizontal forward static load equal to one-half (0.5) of the weight of the articles of cargo being transported on the vehicle uniformly distributed over the entire portion of the front end structure that is within 4 feet above the vehicle’s floor or that is at or below a height above the vehicle’s floor at which it blocks forward movement of any article of the vehicle’s cargo, whichever is less; or(2) For a front end structure 6 feet in height or higher, a horizontal forward static load equal to four-tenths (0.4) of the weight of the articles of cargo being transported on the vehicle uniformly distributed over the entire front end structure. (d) Penetration resistance. The front end structure must be designed, constructed, and maintained so that it is capable of resisting penetration by any article of cargo that contacts it when the vehicle decelerates at a rate of 20 feet per second, per second. The front end structure must have no aperture large enough to permit any article of cargo in contact with the structure to pass through it. (e) Substitute devices. The requirements of this section may be met by the use of devices performing the same functions as a front end structure, if the devices are at least as strong as, and provide protection against shifting articles of cargo at least equal to, a front end structure which conforms to those requirements. What if no header board is present? (2) Two tiedowns if the article is: (i) 5 feet (1.52 meters) or less in length and more than 1,100 pounds (500 kg) in weight; or (ii) Longer than 5 feet (1.52 meters) but less than or equal to 10 feet (3.04 meters) in length, irrespective of the weight. All tiedowns must be adequate for their intended purpose. These are the regulations in effect at this time. 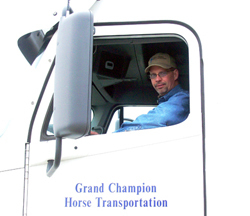 Is a post-trip inspection required by the Federal Motor Carrier Safety Regulations? The Driver's Vehicle Inspection Report. Actual forms may vary. a) Report required. (1) Motor carriers. Every motor carrier shall require its drivers to report, and every driver shall prepare a report in writing at the completion of each day’s work on each vehicle operated . . .
b) Report content. The report shall identify the vehicle and list any defect or deficiency discovered by or reported to the driver which would affect the safety of operation of the vehicle or result in its mechanical breakdown. If no defect or deficiency is discovered . . .
(4) the Original copy needs to be retained by the organization or company for 3 months. (5) the Original copy retained for 3 months (i.e., placed in the master file for that particular commercial motor vehicle or CMV). 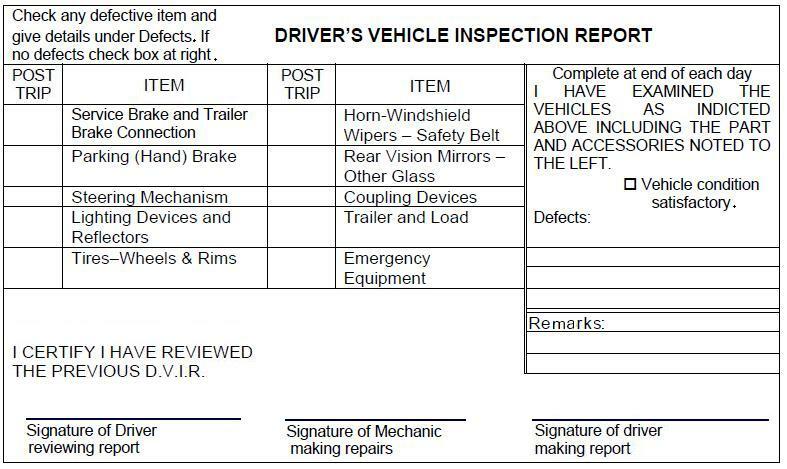 (h) the driver has “check-the-box-itis” and fails to utilize the “Remarks” area to help document his or her observations/inspection(s) during the trip. Use the remarks to document things like: “added oil” or “top-off fluid levels,” “adjusted mirror,” “wiped off reflectors,” “changed a light-bulb.” This extra-step is a good habit that could make a difference later not only in a road-side stop or DOT audit, in favor of both the driver and/or organization, but some day in court. Note any new damage or “mystery damage” to the vehicle. Prepare the DVIR on a separate form (one for each vehicle) so it can be properly filed and controlled. Forms or booklets/pads are sold at most truck stops (or see http://www.jjkeller.com and ask for their transportation catalog). Some companies bolt a special clipboard on the dash next to the driver for better organization. One copy of the DVIR report may stay in the truck (this is not a requirement), however, the original copy (the “signature copy”) is what must be processed and filed, and kept for at least 90 days in the master vehicle file. Failing to make or properly complete a required DVIR can result up to $1,000 DOT fine, per vehicle, per day. It’s a common violation, but one that can be easily eliminated with new habits, protecting the driver*, the public and the organization. The DVIR – don’t leave home without it. * When I train drivers, I tell them, The insurance is on the truck. A driver’s main protection from citations, violations or even career-ending lawsuits is to “document simple” any vehicle safety issues (including those, according to the regulations, “reported to the driver”). In this way, a driver has used the regulations to protect both himself and the organization.